The athletic program at R.E. Mountain Secondary School, grounded in integrity, promotes character development and collaboration. We believe that athletic competition is a powerful teacher. Physical and mental challenges in a team context offer athletes the opportunity to develop leadership skills, self–confidence and a commitment to others that will inspire them to lead productive and active lives. All student athletes must complete the Medical Form as well as agree to R.E. Mountain Athletics Code of Conduct. These can be completed online under the the “Forms” tab on the left side of the page. Participation on any team will require a payment of an Athletic Fee. Generally, there are two levels of athletic fees, “Jr. Sports” ($90 Fee) and “Sr. Sports” ($115 Fee). 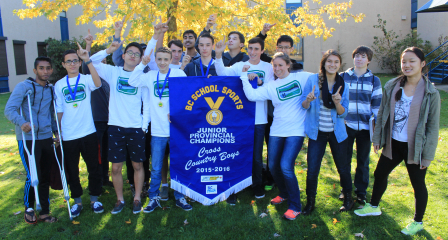 British Columbia School Sports (BCSS) governs high school athletics across the province. They make all decisions regarding athlete eligibility. When a student enter Grade 8 and is registered with BCSS, the school they are registered with becomes their “Home School”. Any movement to another school will require approval from BCSS. Depending on the circumstances of the move this process may be as simple as submitting a simple form or it may require a more rigorous application/appeal process. Measure the success of our program by the degree to which individuals and teams embody our school’s core values. Expect all members of the R.E. Mountain community to demonstrate respect for opponents, officials and the rules of competition. Build healthy, enjoyable and supportive team environments based on trust. R.E. Mountain strives to encourage good sportsmanship throughout our athletic program, and this includes good fan behaviour. We expect all spectators at our contests to be respectful of players, coaches, officials, and other spectators. Fans are encouraged to applaud the efforts of their team and should not engage in any behaviour that is critical, distracting, or derogatory toward opponents or officials. We believe it is imperative to let the players, coaches, and officials play the game. Fans can be an “extra person” for their squad, supporting and cheering on their side, but our school will not permit any behaviour that detracts from the proper conduct of the game or disadvantages a player or team.